"All the Way" mashed potato cone at the Lighthouse Grill in Trinidad. Tragically, the lure of delicately battered fish and chips might keep one from trying the mashed potato cone ($5) at the Lighthouse Grill. There you are at the edge of the sea, salt air, outdoor seating — can you really order a land-locked menu item? Yes. Yes, you can. This is not some state fair gimmick. It's a freshly rolled cornmeal and herb waffle cone, like a crisped version of the savory-sweet cornbread that comes with chili or Thanksgiving dinner. 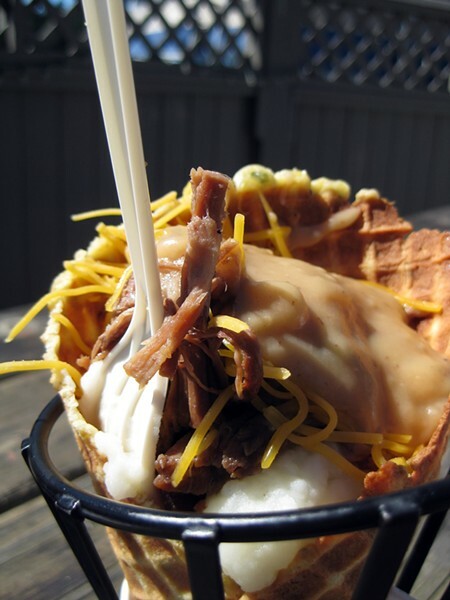 Inside is a hot dollop of creamy mashed potato, fallen-apart brisket in gravy, melting cheddar cheese and pieces of smoky bacon. You can also go vegetarian with veggie gravy and cheese ($4). Do not try go at it without utensils like an ice cream — too risky with the fragile cone. Get in there with a fork and hog toppings; others at your table will want a taste, and you didn't come here to make friends. If the joint is jumping at the, there will be a wait. It took nearly an hour for us, so think outside the box and maybe get an ice cream first so you're not too weak to lift a fork when the main course arrives. Is it wrong to want a turkey version for the holidays? Consider how easy dinner with relatives would be if you could just pick up your dinner in a handy cone and take a walk. You know, just around the block. What's your food obsession, Humboldt? Email jennifer@northcoastjournal.com.